An in-depth study of Lama Tsong Khapa’s Great Treatise on the Stages of the Path to Enlightenment. 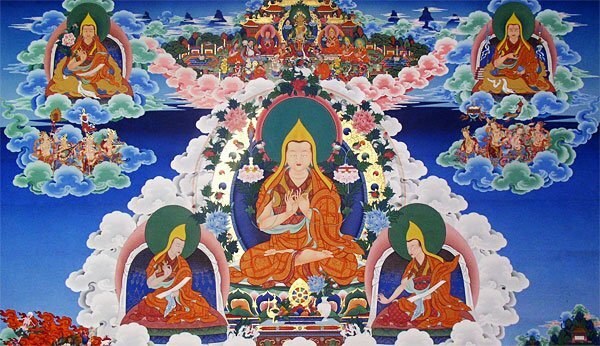 The Lam Rim is the collected teachings and practices of the Buddha presented in methodical way, in the order we are to practice them if we want to reach enlightenment for the benefit of others. This class is best suited for those who have some foundation in Tibetan Buddhism or have completed the majority of the Discovering Buddhism course. It’s an on-going study-group that runs twice a month. You are welcome to join the class even though we are part-way through the text. Study of the text spans several years, so the pace reflects the pace and interests of the class. We are using KR Geshe Tashi Tsering’s commentaries given at Chenrezig Institute during the full-time Buddhist Studies Program. Review questions and notes for the coming class are emailed regularly. When we meet on the Sunday we listen to the teaching on CD, discuss the review questions, study Eddie’s mind-maps and discover further reading from other commentaries. CD and class notes available on registration – please ask Miffi at reception. We can print the notes for you (by donation), or you can view as a pdf. By donation (suggested $10 but no set amount). CD with complete set of course notes $40.